eMag. Author (eMag) License: all rights reserved. BUCHAREST (Romania), March 21 (SeeNews) - Romanian online retailer eMAG said on Thursday it is expanding to the Czech Republic, Slovakia, Slovenia, Croatia and Austria following the merger of its Hungarian unit with local peer Extreme Digital, and will target 1.0 billion euro ($1.137 billion) in sales in six years-time. Following the merger, eMAG Romania will become the majority shareholder of the new entity, with 52% of the shares, while the rest will be owned by Extreme Digital shareholders, eMAG said in a press release. The transaction is pending approval from anti-trust authorities. "This partnership is a recognition of the scalability and quality of eMAG technologies developed in the last ten years. 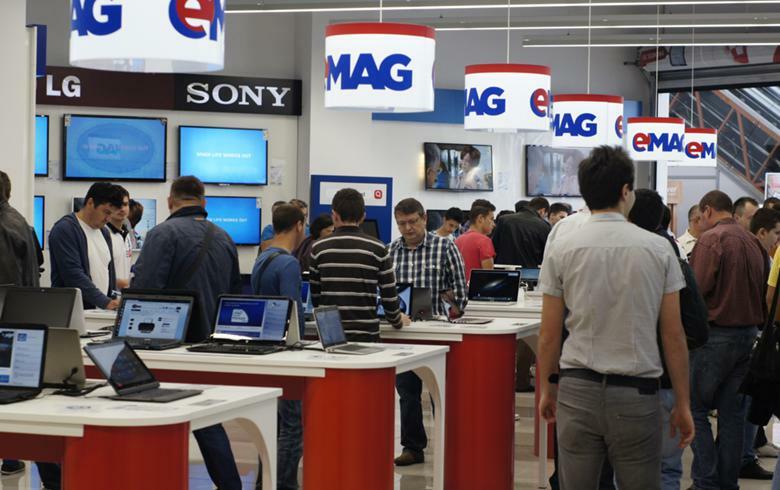 We are confident that eMAG's regional development will speed-up a result of this merger, creating the premises for expansion in countries where Extreme Digital is already active," eMAG CEO Iulian Stanciu said. The technology used in Hungary and in the five new countries will be the one developed so far by eMAG. Extreme Digital uses a hybrid business model combining online and offline shopping, so that customers can receive products they ordered online in the 16 stores the retailer owns in Hungary. Online retailer eMAG was founded in 2001 by Romanian entrepreneurs, and later expanded in Bulgaria, Hungary and Poland. South Africa-based Naspers media group acquired a 70% stake in eMAG in 2012.